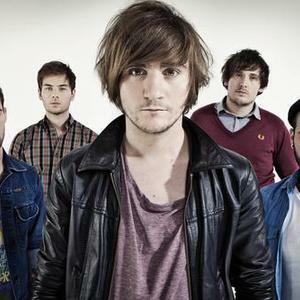 Kids In Glass Houses are a five-piece rock band from Cardiff, South Wales, United Kingdom. The band formed in 2003 and signed with Roadrunner Records in December 2007. Kids In Glass Houses currently comprises vocalist Aled Phillips, guitarists Joel Fisher and Iain Mahanty, bassist Andrew Shay, and drummer Philip Jenkins. The band's debut EP, E-Pocalypse, was released during their time as an unsigned band in 2006. The band's debut EP, E-Pocalypse, was released during their time as an unsigned band in 2006. During this time they garnered a rare and unprecedented amount of press and support from the likes of Kerrang, NME, Big Cheese, Rocksound, Tuned and Total Guitar magazines, as well as BBC Radio 1 and XFM. In a television interview Lostprophets vocalist Ian Watkins claimed that ?Relatively unknown bands such as Kids in Glass Houses are a lot better than a lot of known bands out there.? In August 2007, the band was nominated for ?Best British Newcomer? at the Kerrang! Awards, but the group were beaten to the award by Gallows. The band later went on a headline tour of their own with Tonight Is Goodbye, and supported Funeral For A Friend's December tour, between which they recorded their debut full length. During 2007 the band also supported artists like Lostprophets, Fall Out Boy, Paramore, Cute Is What We Aim For, Simple Plan, New Found Glory and 30 Seconds to Mars. The band also appeared at The Full Ponty Festival, Download Festival, Hyde Park Calling, Farnham's Summer Breeze Festival, Collision Course Festival and the Reading and Leeds Festivals during this year. The band's debut studio album, Smart Casual, was released on 19th May 2008. The album spawned singles Fisticuffs, Give Me What I Want, and Easy Tiger. Kids In Glass Houses released their second album Dirt, on 24th March 2010, along with a digital, special edition of the album on iTunes two days later. The first two singles of the album, Youngblood (Let It Out), and Matters At All, were released prior to the album on 5th October 2009 and on 29th January 2010, respectively. Dirt featured The Saturdays' Frankie Sandford on the track Undercover Lover and New Found Glory on the track Maybe Tomorrow. Their official website is, www.kidsinglasshouses.com.